By Frederick Davis Greene. 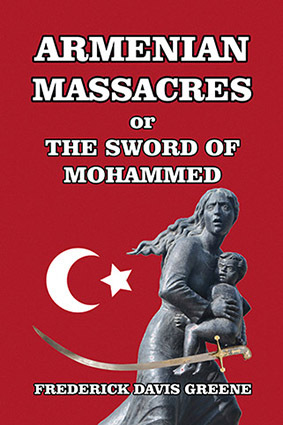 “A complete and thrilling account of the terrible atrocities and wholesale murders committed in Armenia by Mohammedan fanatics including a full account of the Turkish people, their history, government, manners, customs and strange religious belief”—reads the accurate and original subtitle to this masterful account of the Ottoman Turkish Empire’s criminal rampage through Armenia during the nineteenth century. Frederick Davis Greene (1863–1962) was born in Bursa, Turkey, to American Protestant missionary parents from Maine, USA. 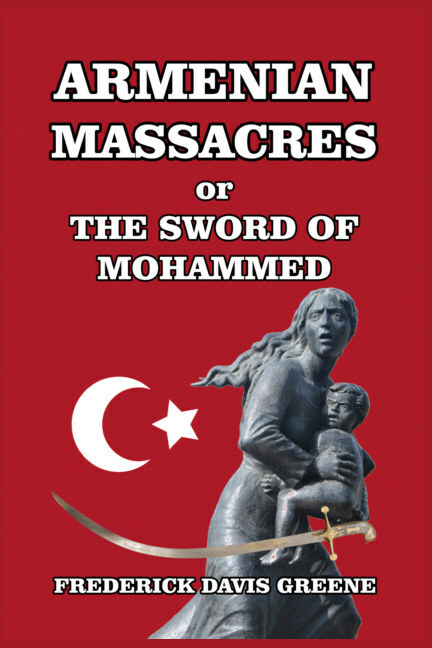 Being born and raised in the Levant, Frederick became acutely aware of conditions in the Ottoman Empire, and after taking up a missionary post in Armenia, wrote profusely on the cruelties Christians experienced under Turkish Muslim rule.